With all yachts in Kupang the end of rally the party has started, on Thursday evening there was a Gala welcome dinner hosted by the provincial Governor complete with traditional dancing and cultural displays. On Sunday over 20 yachts will leave for Kupang for Alor to attend a week long cultural festival in the town of Kalabahi. All the yachts are now in Kupang, Valere and Vindela arrived in the early hours of the morning and the last to arrive was the Norwegian entrant Voi Voi arriving at 0800 today. Further information regarding the events in Kupang will be posted her as it becomes available. At 1600 the last yachts were approaching the entrance to the Roti Strait 10 miles south of Kupang, the last yacht Voi Voi was 35 miles out at 10° 31' 124° 04' in company with 2 Extreme, Kahiba, Sea Tramp and Vindela. These yachts were expected into Kupang late tonight or early tomorrow morning. At 0800 the 15 yachts still at sea reported in on the sched and included in this group are Sea Fever only 15 miles from the finish as well as 2Extreme, Fantasy II, Kahiba, Monte Christo, Onyx, Sea Tramp, Typhoon Princess Valere, Vindela and at the rear of the fleet 100 miles out from Kupang is Voi Voi A number of yachts including Blue Banana, Julia, Nimbus, Sojourner, Tigger II and Tsolo arrived during the night. The new Zealand yacht Risque Affaire skippered by Ian Lamb sailed into Kupang today at 0754 followed by Searose at 0830, Backchat at 1000 and Seaing Double at 1003 with a number of the fleet approaching the southern end of the Roti Strait on the southwest end ot Timor, the yachts at the back in the fleet around 170 miles from the finish were experiencing very light conditions. Included in this group were 2Extreme, Scott Free, Elenor and Typhoon Princess. 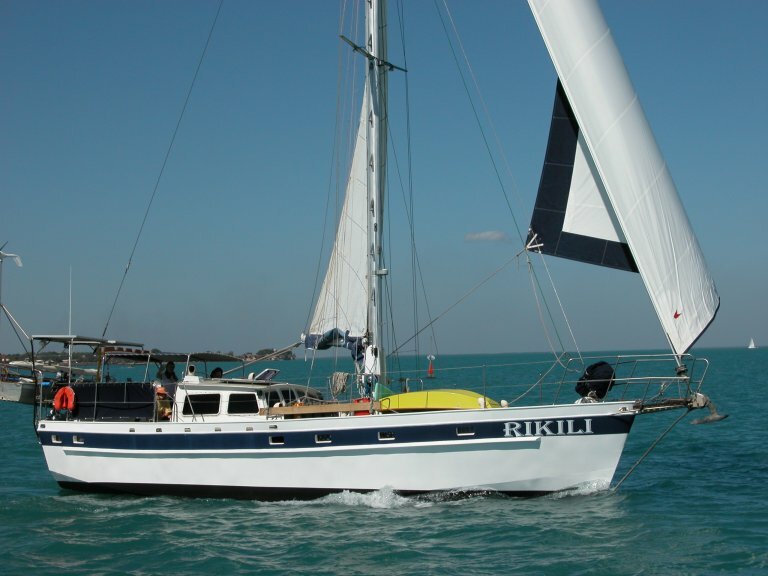 At the 1600 radio sched Brandamajo, Gemini, Guitar, Jacana, Peace and Aloha, Rikili and Shazam had arrived in Kupang with a number of yachts including the radio relay vessel Julia due in tonight. Yachts are arriving all the time an updated list will be available tomorrow. Voi Voi, Vindela and Sea Tramp are at the rear of the fleet with 150 miles to go. All yachts were accounted for on the 1615 sched this afternoon. The breeze has been light over the last few days but increased to 15 knots as the yachts approach Timor. Conditions improved during the day with the breeze increasing to 8-12 knots. 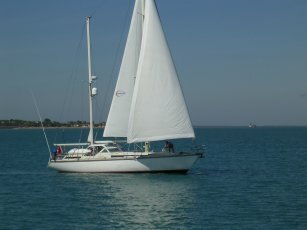 The lead yachts at 1600 were around 100 miles from Kupang. Shazam, Backchat, Guitar, Gemini, Peace and Aloha and Searose were expecting to be in Kupang on the 27th. The main group of yachts were 190 miles from Kupang and included in this group were Monte Christo, Pisces, Sea Star, Sojourner, and Susquehanna. 2Extreme , Sea Tramp, Vindella, Kahiba and Voi Voi were in a group together at the back of the fleet approaching the half way point. All other yachts reported in on the 1600 radio sched on the 26th. At 1630 Risque Affaire had covered 190 miles and was almost at the halfway point, around 10 miles astern were Backchat and Julia. Other yachts in group close behind included Jacana, Legs Eleven, Monte Christo, Onyx and Pamela. Conditions continued to be light with all yachts experiencing 8-10 knots from the east. At 0800 the yachts were experiencing very light conditions with only 4-5 knots of wind and many had started motoring. 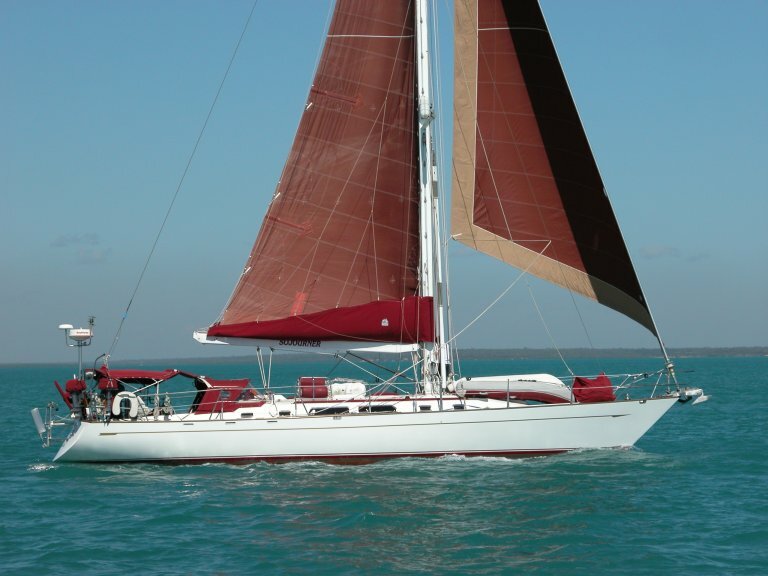 The New Zealand yacht Risque Affaire had covered 150 miles since the start with Backchat 10 miles behind. The Canadian entry Nimbus was a further 15 miles behind with the Swedish entrant Sea Tramp at only 26 feet long 40 miles behind at the rear of the fleet in company with the Norwegian yacht Voi Voi. 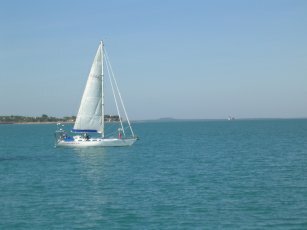 The fleet of 40 yachts left Darwin on schedule at 1100 hours in near perfect conditions in a following 10 knot south easterly breeze, the first yacht to cross the start line was the Swedish entry Vindella sailed by the single hander Jack Oldenburg followed closely by a second Swedish entry Elenor skippered by Berit Lithner. 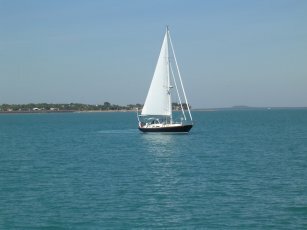 At 1600 hours today the leading yachts were approximately 50 miles from Darwin in good sailing conditions in 10 - 15 knots of breeze. Swedish entry 26 footer "Sea Tramp"
This year the event was the slowest ever with the last yachts taking 14 days to sail the route from Darwin to Bali. The partcipants were guests at the presentation dinner complete with a traditional Balinese welcome held at the bali International Marina. The USA entry Hana arrived in Bali at 1500 today. The Danish entry Nardis arrived in Bali at 1200 today. The Swiss entry Escara arrived in Bali at 1000 today together with Little Blue, and at 1400 Caprice was entering the harbour and were looking forward to their first hot shower in 11 days. On the 0800 radio sched the Danish entry Nardis was 75 miles from Bali and were expected in Bali on the morning of the 12th. At 1000 Xhabbo arrived in Bali and Helene II arrived in port at midday. On the 0800 sched Caprice was at 9° 42' and 116° 50 and had covered 120 miles in 24 hours. Escara were at 9° 45. and 116° 04' 50 miles out, the last yacht Nardis still has 150 miles to go. The wind in the area was reported at a steady 10 - 12 knots. All yachts called in on the 1600 sched and were making good progress in the improved wind conditions. Running Cloud skippered by Larry Pollock arrived in Bali at 1700. At 0800 Luna was at 09° 35' and 117° 32' with 140 miles to go to Bali and is expected in port at first light on the 9th. 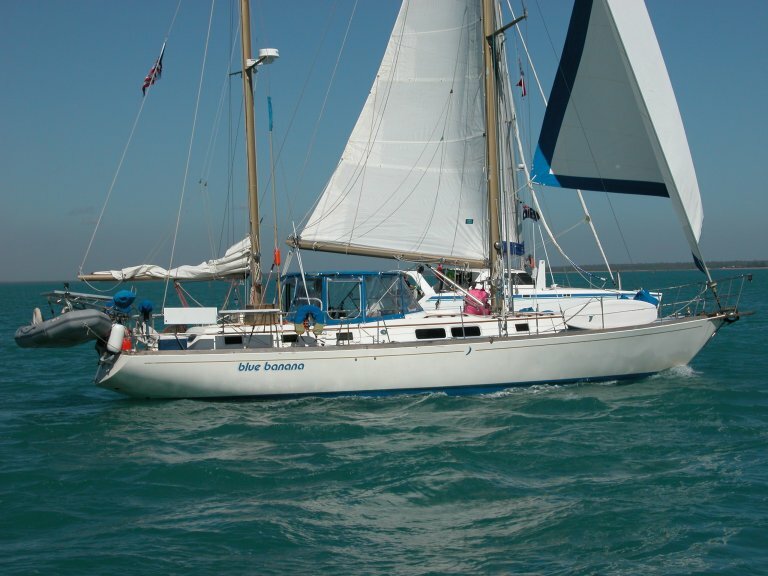 Parmelia is also around 150 miles out and is due in on the 9th at around midday. Hana and Helene II are together 240 miles out with Escara at 10° 31' and 120° 31' 50 miles behind. Caprice and Little Blue are together with 300 miles to go and Nardis is a further 20 miles behind. Conditions have improved with all yachts experiencing a steady 15 knot wind from the south. At 0800 Amalthea had arrived in Bali and Aint Misbehavin arrived at 1530. At 0800 Luna was 310 miles from Bali at 10° 118° 51' and has taken over the role of the Radio Relay ship and is providing invaluable assistance in forwarding the position reports. Escara, Hana and Helene II were grouped together at 10° 45' and 121° 20' with 400 miles to go. 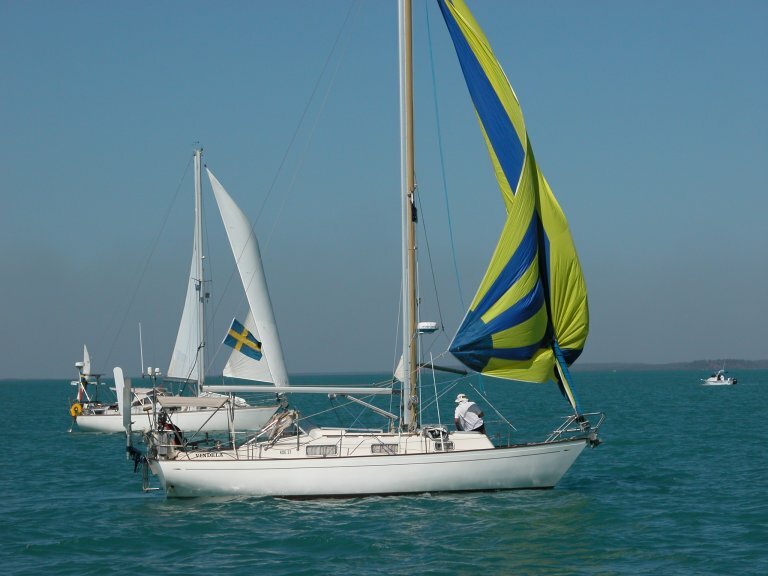 Little Blue left Darwin 2 days after the rest of the fleet and was at at 11° 31 and 123° 12' 55 miles behind Caprice. Agape arrived in Bali today at 1530 and Almathea was motoring approximately 100 miles from Bali and was expected to arrive in Bali on Saturday morning. 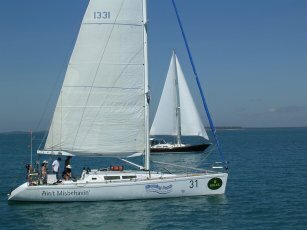 The remainder of the fleet are still sailing and are being led by Aint Misbehavin at 10° 06' 118° 25' about 200 miles from Bali. Parmelia has 360 miles to go and Luna were at 10° 23' and 121° 53 with 398 miles to go. Caprice is only now approaching the halfway point at 11° 25' and 123° 27', the rest of the fleet are grouped between Caprice and Luna. Conditions have improved somewhat with the southeast trade flow becoming re-established. 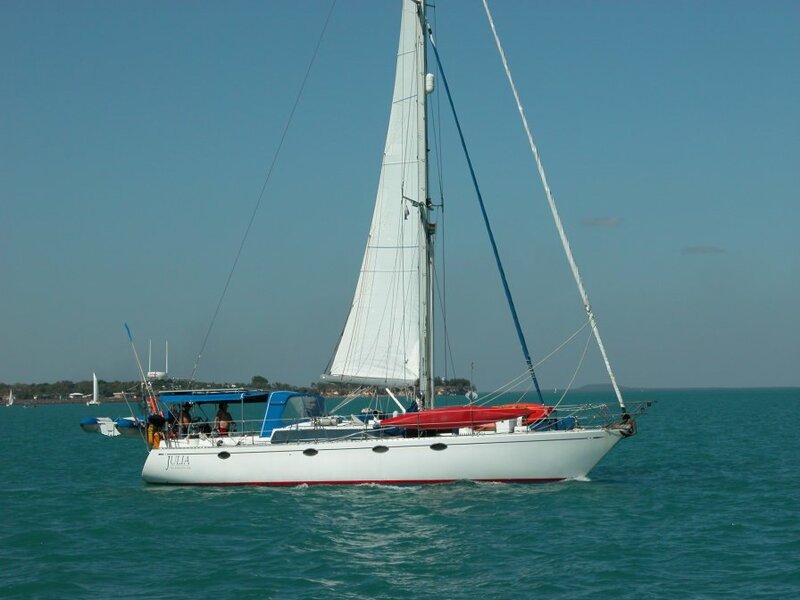 Luna, Amalthea and Aint Misbehavin report a 10 knot south-easterly breeze but conditions are still very light. 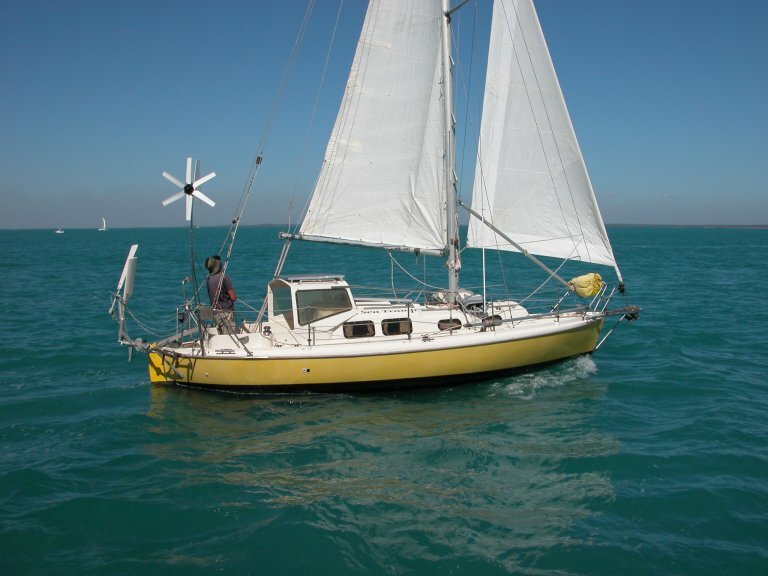 At 1600 today Agape was 811 miles from Darwin with Amalthea 41 miles behind, both are motoring and are expected into Bali on Saturday morning. 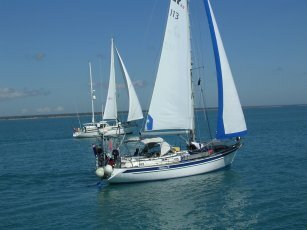 The yachts that are still sailing and sticking it out in the trying conditions are being lead by the South African entry Aint Misbehavin at 10° 39 and 120° 15' , located 10 miles south of the island of Sumba. Luna is 500 miles from Darwin at the half way point with Parmelia 55 miles behind. Xhabbo had called into Kupang to take on additional fuel for the trip as conditions are so light. The yachts are still experiencing very light conditions with winds today from the west at seven knots making this event the slowest in it's five year history. All other yachts called in on the 1600 radio sched. Late today the yachts were approaching the halfway mark, they are still in light conditions in a group 100 miles south of Kupang on the island of Timor. Agape has continued motoring and was 70 miles south of the island of Sumba. At 0800 the fleet was still making slow progress in very light conditions, however the forecast for the area is for increasing breeze later today Amalthea was at 11° 37' and 126° 52' in only 3 knots of wind, Parmelia was at 11° 54 and 126° 35'. Aint Misbehavin had covered 350 miles since Saturday. All other yachts called in on the 0800 sched. At 0800 conditions in the area were still light and variable Aint Misbehavin skippered by Rob Alexander was at 11° 01' and 127° 16' 220 miles from Darwin, Caprice was at 11° 39' 128° 20' 50 miles behind. Hana skippered by Steve Anderson had only covered 150 miles since the start. All other yachts were accounted for on the 0800 sched. At 1600 today the winds were still very light with the two Swiss entries Escara and Helene II 120 miles from Darwin with the Norwegian entry Nardis 10 miles behind. Amalthea had retired and was motoring. 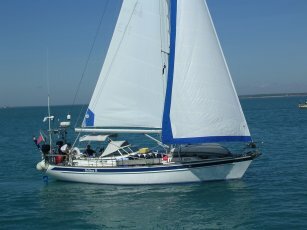 The winds at this stage have been disappointing as in past years these yachts would have been averaging 150 miles a day. Xhabbo skippered by Don Ross reported that they were almost drifting in a 3-4 knot breeze. 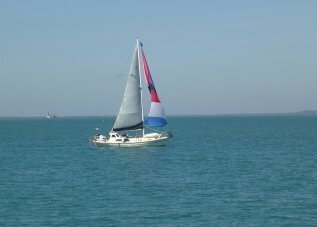 At 0800 the yachts were 70 miles west of Darwin with no wind and making slow progress Aint Misbehavin was at 11° 49 and 124° 24 and the other yachts were in the same area. The yachts started on time at 1100 hours today, they started in light winds and were led out of the harbour by Pamela and Luna, Little Blue and Harmony have been delayed by technical problems and will leave tomorrow. 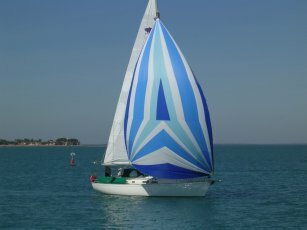 On the 1600 sched the yachts reported variable wind conditions ranging from 3 up to 12 knots. 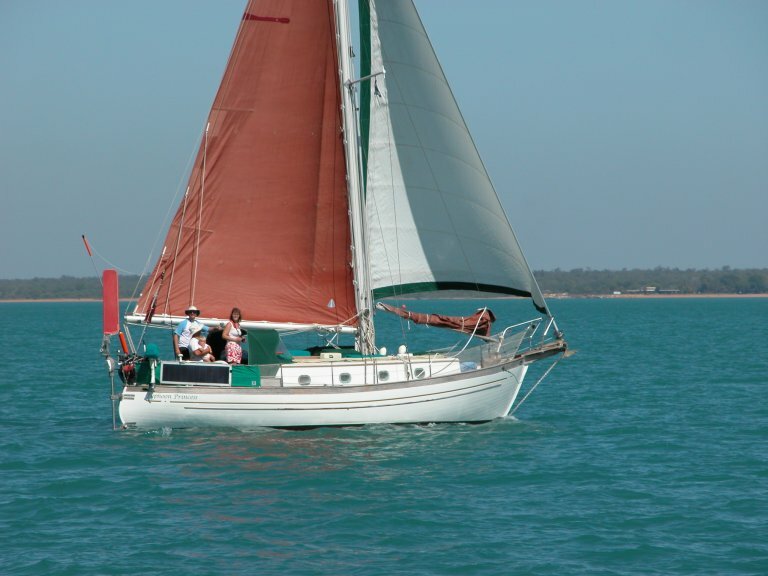 All yachts reported in and were in a small group approximately 30 miles from Darwin. 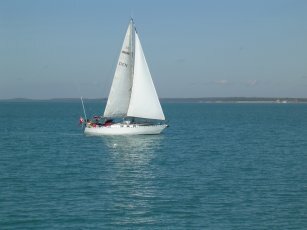 One yacht was arrested only 3 hours before the start by the Sheriff of the Supreme Court of the Northern Territory and not make it to the start line.